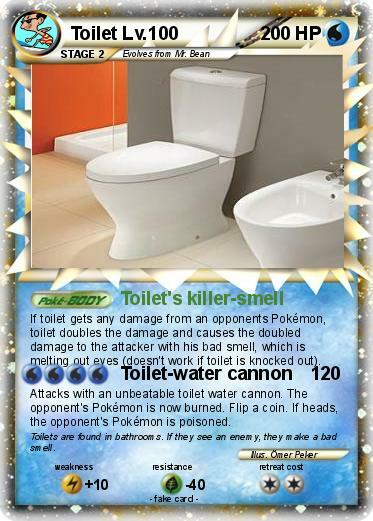 If toilet gets any damage from an opponents Pokémon, toilet doubles the damage and causes the doubled damage to the attacker with his bad smell, which is melting out eyes (doesn't work if toilet is knocked out). Attacks with an unbeatable toilet water cannon. The opponent's Pokémon is now burned. Flip a coin. If heads, the opponent's Pokémon is poisoned. Comments : Toilets are found in bathrooms. If they see an enemy, they make a bad smell.